Every dive should end with a safety stop. But being close to the surface makes buoyancy a challenge, and without the right technique, you might find yourself ascending unintentionally. Here are five tips for making safety stops look easy. 5 Tips for a perfect safety stop. 1. SLOW ASCENT Keep an eye on your computer or depth gauge to make sure you ascend no faster than 30 feet per minute. Remember to vent expanding air from your BC as you go, and always send up a surface marker if you’re ascending away from your boat. 2. PROPER POSITIONING Once at 15 feet, position yourself head-up and keep your depth gauge at chest level so your torso stays at the right depth. 3. STEADY AS SHE GOES If you’re holding a down line attached to boat, grab the line loosely with one hand, with your arm outstretched to prevent the line from pulling you up and down. Always time your safety stop. 4. TIME IT Every diver should time his or her own safety stop — don’t rely on another diver. 5. SWIM SLOWLY Divers sometimes think once the safety stop is over, they can fin to the boat as fast as they want. But the final 15 feet are the most dangerous part of the water column for lung-overexpansion injuries. Ascend the final 15 feet at the same, slow 30-feet-per-minute rate. Courtesy of Dive Training Magazine. With the recent closures of area beaches from possible Red Tide and the issues of Green Algae, we need to take consideration as to possible health issues when diving. 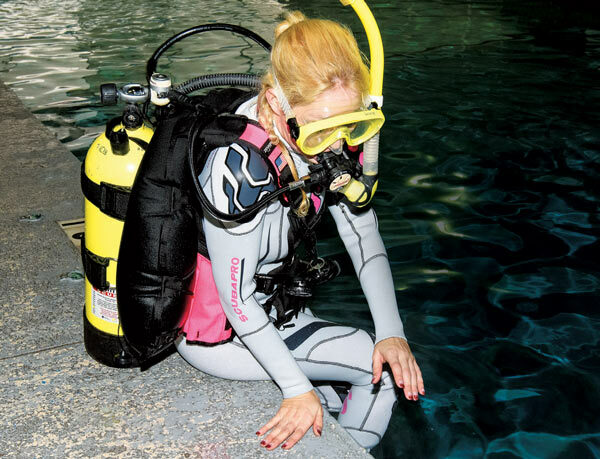 Here is a 2011 article from Alert Diver Magazine on health considerations when diving. A threat to scuba divers? Human potential for contracting diseases from pathogens in the marine environment depends on exposure time, the virulence of the pathogens and the susceptibility of the individual. Microbes generally infect humans through ingestion, inhalation or mucous-membrane exposure (naturally occurring or in wounds). Microbes can infect through injured skin, the ears and the mucosa of the mouth, eyes and nose. Infections may also result from swallowing water. Nonfatal drowning in marine environments brings seawater into the lungs and can result in pneumonia. Some hazards like aerosolized bacteria, generated in coastal environments by wave activity, can transmit algal toxins to humans and cause viruses to become airborne. This type of hazard is less likely to cause illness in divers than swimmers, thanks to masks and regulators. Risk of direct infection by microbes from seawater is very small. However, the risk increases significantly in warm, brackish waters, in waters proximate to sewage and run-off inlets, at places of animal access and at populated beaches Divers may acquire dive-specific infectious diseases from exposure to the marine environment or as a result of close contact with other people and their dive equipment. If equipment is not properly cleaned, dried and stored after use, colonies can grow and microbes can reach sufficient numbers to infect users. Paradoxically, efforts to protect equipment from the corrosive effect of sea salt may also result in unwanted risks to divers' health. — under running water when possible. Most dive operations offer some kind of communal fresh-water tank for the postdive rinsing of equipment. Generally there are tanks for rinsing wetsuits, masks, boots, regulators and buoyancy compensation devices (BCDs) along with separate tanks for photo equipment. Despite the best of intentions, such a system may demonstrate more care for camera equipment than for human health. The volume of dive gear passing through rinse tanks in a day may significantly exceed the volume of water in it. Because of the inequity, rinse tanks become the means for collecting and concentrating microbes from all users, creating the potential for spreading infections among them. In 2007, a research team under Michael Miller of West Virginia University embarked on a study to sample water from communal rinse tanks and check it for the presence of bacteria. The first test was conducted at a popular Caribbean dive destination. For four days, the team collected daily water samples from communal rinse tanks after they were first filled in the morning and again several times throughout the day. They divided small amounts of the water samples onto agar plates and subsequently observed bacterial growth of different morphologies and swimming patterns. They did not attempt to identify the bacteria during this phase of the study and, therefore, did not determine if any were harmful to humans. This preliminary research simply confirmed the possibility of significant bacterial presence in rinse tanks. Several months later, a similar study was undertaken at a dive facility on another Caribbean island. The operation's two boats each had two rinse tanks: one for wetsuits and BCDs and another for masks and regulators. The operator fully cooperated with the study; for five days the wetsuit tanks were drained each morning, and one of them was cleaned with bleach before they were refilled. The team took water samples from both tanks at that point and again at multiple times throughout the day. Notably, this facility also allowed the sampling of water from the pipes used to fill the tanks, an opportunity not previously afforded the team. Tests showed the water used to fill the tanks was free of bacteria, nor were bacteria detected in either tank immediately after they were filled in the morning. However, by the afternoon all three tanks contained a lot of bacteria of many different types. Precleaning with bleach did not impact bacterial contamination. The two mask rinse tanks on the boats were also sampled, and both of these contained very high levels of various, unidentified types of bacteria. The time pattern of the findings indicated the bacteria were rinsed off of the diving equipment, but it remained unknown whether they originated from the sea or from divers as well as if they were pathogenic. Public health officials measure levels of certain species of bacteria to evaluate the risks to humans in many popular recreation areas. In June 2008, the team performed a third study with the aim of identifying bacteria in rinse tanks along with their source. The study was done at yet another Caribbean dive resort. Water samples were collected from the hose used to fill a communal rinse tank, the rinse tank itself, buckets on the boats in which masks were rinsed and stored, several dive sites in the ocean at various depths and, finally, ocean water near shore at the dive facility. Again, the water used to fill the rinse tanks was found to be safe. But this time the bacteria that developed throughout the day were identified, confirming that some likely originated from the ocean and others from the divers themselves. None of the identified bacteria would be considered overt human pathogens, but some are considered opportunistic pathogens: They could infect individuals with compromised immune systems or may infect open wounds. Bacteria identified in the communal rinse tanks are generally associated with unsanitary conditions. Where these bacteria are present, other pathogenic bacteria may occasionally occur. The scope of the study did not include checking for viruses usually found along with bacteria that may cause serious diseases. In March 2006, a group of 27 health-care providers attended a conference at a dive resort in the South Pacific. On the second day of diving, two divers reported eye problems, and over the next few days 13 divers (roughly half of the group) were diagnosed with conjunctivitis, an inflammation of the eye. It is characterized by the sensation of a foreign body in the eye, redness of the mucosa and possible discharge. Conjunctivitis of viral or bacterial origin spreads easily from person to person through close contact. There was an outbreak of conjunctivitis among the local population, but the divers did not have much contact with them. Two physicians from the group investigated the spread of the conjunctivitis among the divers. They concluded the conjunctivitis originated from a divemaster who had an eye infection prior to the diver outbreak. The divemaster placed his mask in a communal container of diving masks, which apparently became the means by which conjunctivitis was spread among the divers. Only divers who used this tank were infected. Those who did not use the tank were not infected despite close contact with those who were. To prevent further spread of infection, divers used bleach and detergent for mask cleaning. Affected divers received antibiotic drops and ointments and were healed in the next several days. One diver manifested symptoms after returning home. This case study demonstrated that disease can be spread among divers using communal rinse and storage containers. Conjunctivitis is a disease with short delay from infection to symptom manifestation, which made it possible to identify the source of infection. Other infections may have been transmitted by the same means, but due to longer periods of incubation as well as occurrences after the divers returned home, the link to communal tank was missed. Based on the lack of reports, the risk of infection by means of communal rinse tanks appears negligible, however, it's possible divers incorrectly attribute such infections to other sources. Miller's findings and the report of the conjunctivitis outbreak indicate communal rinse tanks may serve as avenues of infection transmission between divers. When it comes to rinsing dive equipment in direct contact with divers' skin and mucous membranes, such as masks and regulators, instead of using communal rinse tanks, divers are advised to clean gear using disinfectants under running water. Besides rinse tanks, there are at least three additional areas in which infections may spread among divers: the common, the rare but dangerous and the feared but unlikely. The most common infections reported in diving are otitis externa (swimmer's ear) and skin infections (impetigo and others). Fortunately, these can be easily prevented, diagnosed and successfully treated. On the other hand, diving or swimming with an open wound may result in a rare, but often fatal, infection with Vibrio vulnificus, an opportunistic pathogen commonly found in warm coastal waters. The Centers for Disease Control and Prevention receive approximately 150 reports each year of people infected with V. vulnificus, most by eating oysters and a few through open wounds. Some divers fear sinusitis and cystitis (bladder infection). Indeed, swimmer's sinusitis has disrupted the careers of many aspiring athletes. However, it is most often caused not by microbial infections but by chemical irritation from chlorine used to disinfect pool water. It does not occur in ocean swimming. Indeed, some people with chronic sinusitis maintain that swimming in the sea and flooding their sinuses with salt water helps, a notion seemingly supported by an increasing number of ear, nose and throat physicians who advise patients to use saline sinus rinses to relieve nasal and sinus congestion. However, it's important to remember that the intentional or inadvertent introduction of seawater into the sinuses could cause infection if the introduced water is loaded with a sufficient number of pathogenic bacteria or viruses. It is difficult to come by any such cases in conventional medicine literature. While it seems there are many microbial hazards in the sea, the true risk of serious infection to divers seems negligible. Most infections that may be occurring among beachgoers, swimmers and divers probably manifest as diarrhea, but that is so common among travelers it is rarely linked to seawater. The two most common infections in divers are ear and skin infections. 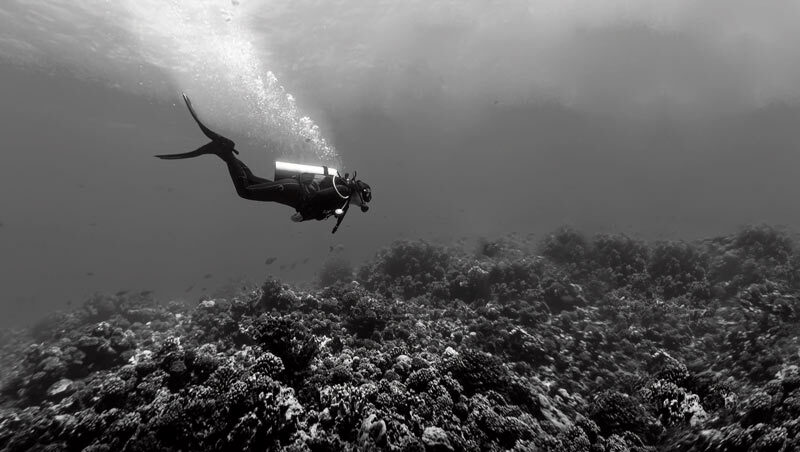 To mitigate risks of infection while diving, regularly clean and disinfect equipment, avoid polluted waters, never dive with open wounds (including tooth extractions) or sores, never rinse your mouth or sinus cavities with seawater, keep your ears dry, avoid prolonged wearing of wet clothing and shower after diving. Divers with an acute infection such as a common cold, conjunctivitis, skin infection or gastroenteritis are not fit to dive and must take precautions not to infect others. Waterborne disease outbreaks (WBDO) have been reported in people bathing in pools and rivers but not among seaside beachgoers. However, due to presence of the diarrhea-causing microbes on seaside beaches, epidemiologists assume that cases of gastroenteritis resulting from exposure to marine pathogens must be common, too. The summertime increase in occurences of gastroenteritis in coastal states indicates a possible role of beaches in disease transmission. Although the risk is considered to be very small, second stages and mouthpieces could transmit disease. Divers are encouraged to disinfect equipment properly. Commercial products designed for cleaning dive gear are widely available. Make sure to choose a cleaning agent that does not contain hydrocarbons. If in doubt about a product's usability on dive gear, consult the equipment manufacturer for recommendations. To clean scuba regulators, use a scrub brush to remove any gross contamination such as mud, dirt, sand, seaweed or saliva from the regulator. Rinse thoroughly with fresh water, then spray a liberal coat of the chosen cleaning agent on and into the mouthpiece and second stage until all surfaces are wet. Let stand for 10 minutes. If the solution appears to be drying, apply more to keep the regulator wet for the full 10 minutes. After 10 minutes, rinse with clean, fresh water or under running potable water. If several regulators need to be sanitized at the same time, or if you prefer immersion to clean the equipment, regulators may be immersed in the disinfectant solution for 10 minutes and then rinsed in fresh water. Use the same procedure to sanitize snorkels and the oral inflation tubes of BCDs. To clean the BCD thoroughly, pour several ounces of the solution into the bladder and agitate for 10 minutes. Then empty the bladder and rinse with fresh water. Before reassembling, allow the BCD to air dry. Miller MR, Motaleb M (2007). "Scuba divers rinse tanks harbor many microorganisms." Microbe 2(12): 577. Olsson DJ, Grant WD, et al. (2008). "Conjunctivitis outbreak among divers." Undersea Hyperb Med 35(3): 169-74. Washburn BK, Levin AE, et al. "Identification of bacteria in scuba divers' rinse tanks." Undersea Hyperb Med 37(4): 233-40. We are fairly spoiled here in South Florida with dive boats set up for easy diving. But as we have seen on some of our travels, sometimes we need to do water entries outside of the normal one we do. The Easy In: Tips for Performing the Giant Stride Entry (GSE)Always evaluate the entry area before gearing up. This is especially important if diving from a boat. Check for any visible hazards. Entry areas vary from boat to boat. Some are as much as six feet above the surface of the water making it necessary to perform a high-platform version of the GSE. You may need assistance from a crewmember, especially if there are no handrails or bars to grasp for balance. A water-level swim platform extending from the stern of a boat is the easiest type of entry area. If you are diving from a stable platform such as a pool deck or dock, check the water level to confirm it is deep enough for a safe entry. If you don’t know the depth, do not enter the water to avoid an injury. 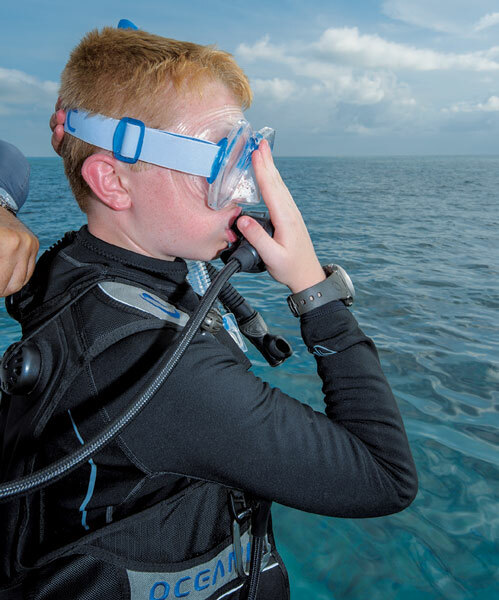 After donning the fins, place your mask securely on your face and the regulator in your mouth. Partially inflate your buoyancy compensator (BC). Move to the outer edge of the platform, place the balls of your feet on the outer edge and extend the fin blades over the water. 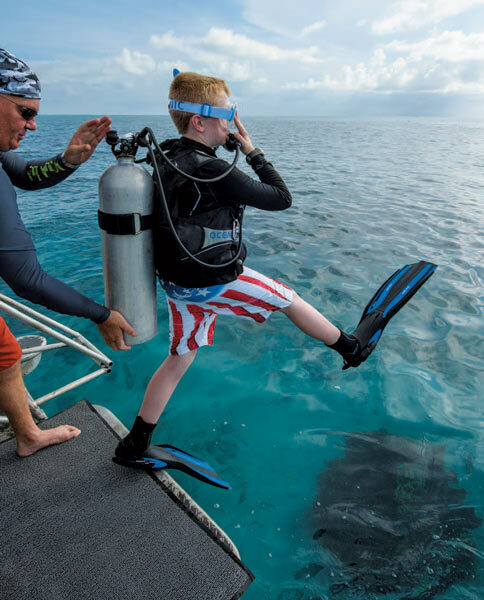 Whether entering the water from a rocking boat platform or a stationary pool deck, position your feet so the fin tips are not below the surface as you begin your giant stride. 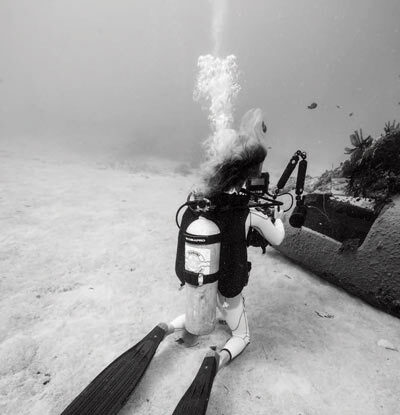 Once you are properly positioned and ready to make your entry, take one last look into the water close to the entry point to confirm there are no obstructions (such as another diver) in the vicinity. Watch for diver’s bubbles beneath the surface. If you see any bubbles, delay your entry until the area is clear. When wearing a weight-integrated BC, use one hand to secure your mask. The other hand can be used to hold gauges close to your body or used to secure the mask strap. 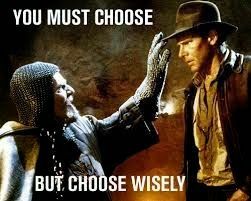 The choices you make are determined by your gear configuration and personal preference. Your scuba instructor can help you decide what works best for you. Either leg may be used to stride outward from the platform. Raise the leg high, keeping the fin tip pointing upward to avoid dragging it in the water, which can cause an awkward “face plant” entry. The foot remaining on the platform will pivot on the edge as you are carried away from the boat by the momentum of the giant stride. As you take this giant step away from the boat, enough space will be left for the scuba tank to clear the entry platform. The first step begins by seating yourself on the edge of the entry platform or, in our case, the pool deck. Don your fins and scuba unit. Your buddy or divemaster may need to assist you when donning the scuba unit. After the unit is in place, confirm that the gear is secured properly. Hoses and gauges need to be clipped and stowed to avoid the possibility of getting caught on the platform. Now partially inflate the buoyancy compensator (BC), don your mask and place the regulator or snorkel in your mouth. As you begin the entry, you are seated so that your bottom is near the edge of the platform, your legs are bent at the knees and your lower legs and feet are in the water. For the CSE to be successful, proper placement of the hands is critical. To begin this step, place the heel of your right hand on the edge of the pool deck, fingers facing the deck and the wrist near your thigh. This hand position may feel awkward at first, but hand placement — with the heel of the hand on the edge of the platform and the fingers pointing away from the water — is important as you initiate Step 3. With gear in place and right hand positioned as in Photo 2, move your left arm across your torso while twisting to the right, pivoting on the right hand, transferring your weight onto your arms. The right arm will remain straight (vertical to the pool deck), allowing you to stay close to the edge of the pool. This step begins as you place your left hand on the pool deck. The left arm will remain vertical to the pool deck with fingers pointing toward the deck. The hands will be shoulder-width apart. You will be leaning slightly forward, facing away from the water. At this point you have the option of stopping the entry process if needed or continuing on to Step 5. The final step provides a transition from pool deck to water. Done correctly, there will be little or no splash upon entry. With both hands and arms in the position shown in Step 4, slowly lower yourself into the water. Your partially inflated BC will provide the buoyancy needed as you lower into the water. At this point you may wish to add more air to your BC to float comfortably at the surface while you wait for your buddy to enter. Enjoy and thanks Dive Training Magazine for the help. Divers training had a good article a few years ago on Nitrox issues and since most of us dive Nitrox, it is important to know some risks. The article is quite long, so I cut to the key sections. Here is the link for the full version. Preperation at home is just as important as for a dive. June 1 has arrived and this means hurricane season. As we leave for our summer dive trips, Yah Caymans, we leave our homes vulnerable. Although the likelihood of early hurricanes are rare, one can never predict mother nature. With this in mind we need to prepare our homes and cars before we leave for our trips. This means we need to keep in mind when the peak storm season is and be ready to come home from a trip a few days before a storm and find the stores empty. This should not be the time to prepare and you should have done it early. As we continue our travels, it is important to start stocking up on goods early and have them set before you leave for your vacations. For me this is an important must do. Since I work for the City of Ft Lauderdale, I am typically called in early to assist the city to prepare for the storm. This means that while everyone is fighting for gas at the pumps, I am already at work keeping the peace. So I must have my preparations done very early. I always ensure that I have my stock in order early, which I have already done and am ready to return from a trip and goto work the next morning. There are dozens of links to help you prepare and I have attached the links for Broward and Palm Beach EOC. If you get stuck on a trip have a plan in place with some friends of family to secure your home. Although be gentle on them because they are doing you a big favor. With all the negatives out of the way , time to enjoy a great dive season. Stay away hurricane. 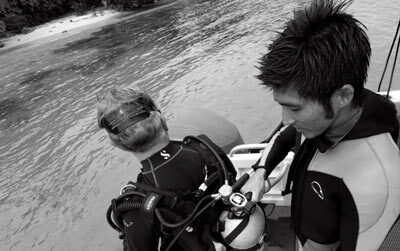 As we prepare for our busy local and overseas dive season, it is always a good ideal to refresh our basic dive skills. The basic skill you learned in your Open Water Class are important every time you dive, even if you don't have to use them. I can't tell you how many times my mask has flooded or my tank came loose as I bankrolled off of a friend's boat. Although considered a unusual issue, it was easily handles with little issue because of the confidence I had in my basic skills. So what should I focus on and how can I practice. When ever I get new gear or items back from service, I love to jump into my community pool and test it out. I also use this time to practice some basic skills like mask flooding , regulator recovery, and locating my alternate air source. What if you don't have a pool? Well, next time you are on a club dive at the end of the dive practice your skills. 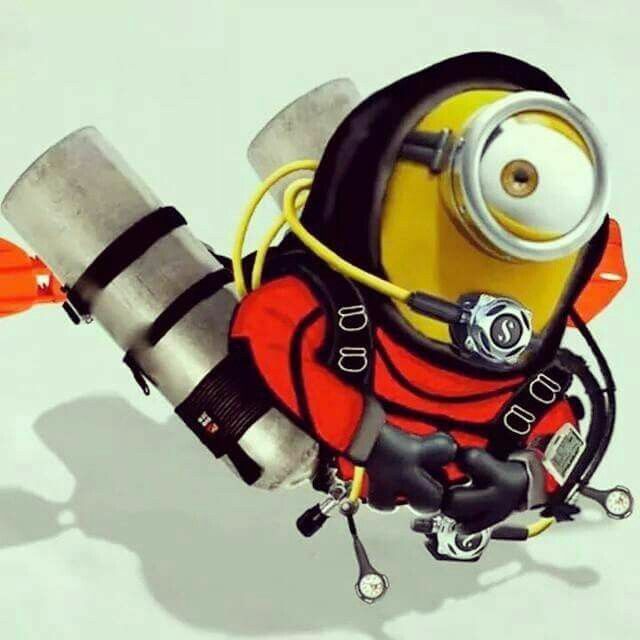 Just remember to brief your dive buddy first, so they know. Take your time to go through your kit, and make sure all is in order, and that you’re being extra thorough in assembling the elements. Haste makes waste. So take your time. 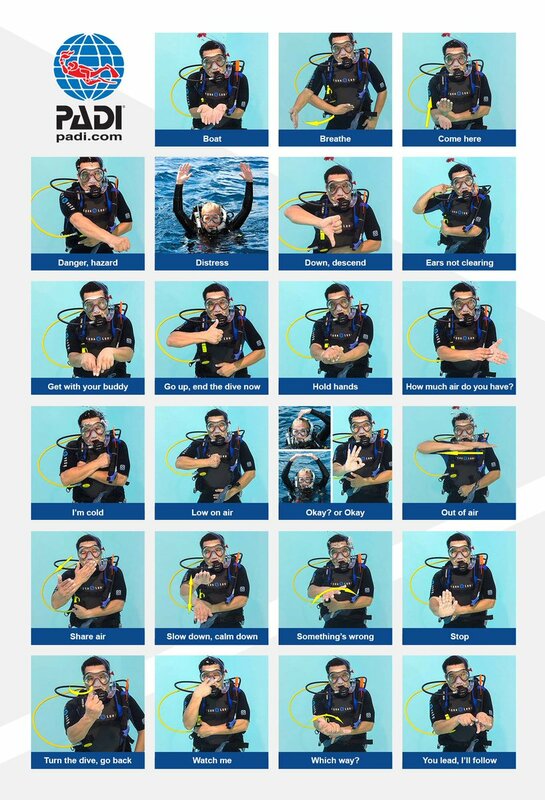 Go through the basic dive skills. Do a hover (if you struggle, start with the fin pivot), remove and replace regulator, remove and replace mask. If you’re really ambitious, you can also remove and replace BCD and weight belt at the surface. And if your buoyancy is top notch, take it up a level and try inverted hovers, trim, etc. If you have the opportunity, also practice a few water entry strategies, such as giant stride. Next, move to the more advanced skills, and consider repeating these from time to time, in-season. These include deploying an SMB, out-of-air scenario, and re-surfacing of an unconscious or injured diver. If you dive with doubles, also practice your basic shut-down drills. Agree with your buddy that at some point during the dive, you both need to communicate something on the dive, preferably rather complex, to the other. Make it scenario based, and make sure you have a sign to communicate that this is in fact just a scenario. Bring two writing slates or wetnote books. You or your buddy then communicates a message to the other, who then writes down what he or she believes is communicated. Then you switch. Afterwards, you've compare notes and see how efficiently you've communicated the messages. 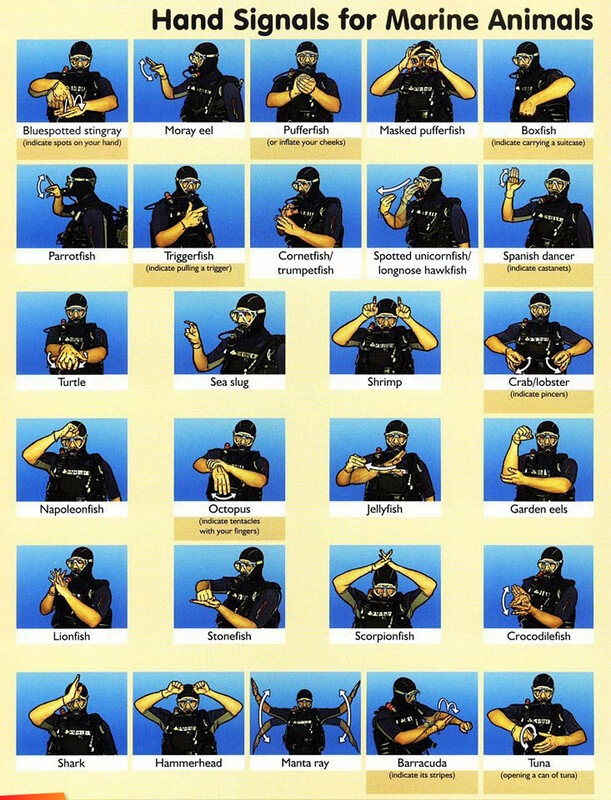 All of these skills are of course necessary for all scuba divers.. So a beginning of season run-through is valuable, and elements of it should be repeated during the season, preferably on easy dives at well-known sites.